The East vs. West series started thanks to the West’s usual dominance over the East this season, but also thanks to a post by Basketball-Reference detailing the historical disparity in the conferences over the years. This is the final post this season. A bit late thanks to a fever that doesn’t seem to be letting up anytime soon and looking into a few projects going forward, but below is the final week-by-week non-conference breakdown. 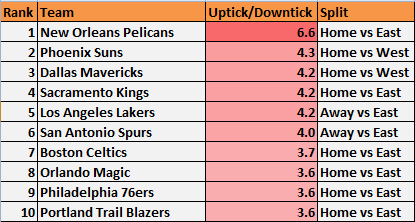 Followed by that are the final point differential tables and also some splits for how teams performed versus each conference and on the road or at home. There are some pretty glaring differences in each. The last game featured Detroit Detroiting to Oklahoma City, falling in the final minute to a Thunder squad looking to clinch the second seed out West. Onto point differentials with the first sheet comparing this season’s margin of victory with others and the second sheet looking at month-by-month splits of this year. Sample sizes are somewhat small for each. There are 15 non-conference home and road games and 26 games each for teams in the same one, but especially for squads in the same division. It makes for some big swings when comparing splits, especially for a team that goes through a roller coaster of a regular season like, for example, a trip to the West coast while dealing with injuries or turmoil then hit its stride after hosting some games. There’s a noticeable drop-off when comparing arguably the easiest games (at home versus a team out East) and arguably the most difficult (on the road versus a West squad). Comparing the former to the latter, New Orleans has the biggest decline in scoring, scoring 10.2 points/100 possessions less. Detroit, Milwaukee, and Cleveland have upticks, oddly enough. Like scoring for teams hosting East opponents compared to on the road against the West, the difference in allowing points per 100 possessions is pretty large. 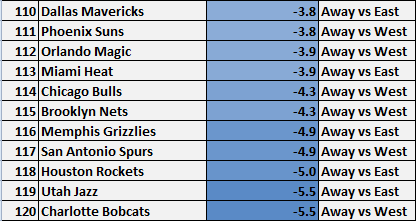 Again comparing the former to the latter, every team allowed more points on the road against West teams with Cleveland at the largest with +14.1 points. For nearly the entire season, the Spurs were the only team to allow less than 100 points when on the road against the West, a spectacular feat when they rested their trio (and more) for a decent chunk of those games. That accomplishment disappeared after their games at Oklahoma City, Minnesota, Dallas, and Houston. The last sheet, regarding net rating, features some more startling numbers. Indiana somehow has a negative net on the road against East teams while Minnesota, among others, has a quite a change when comparing games at home versus the East to any other split. There’s also a 20 point/100 possession difference for New Orleans when comparing games at home versus the East and on the road against the West. It’s the highest difference when comparing those two splits. Indiana (16.1), Houston (13.7), Chicago (13.5), and Minnesota (13.0) round out the top five. The Spurs and Clippers are among the more consistent teams when comparing each category. Overall, this all confirms the obvious: Teams often performed much better against the East than the West and even more when adding home-road splits, though the sample sizes for each are somewhat small. This was a fun series to fool around with each week, and it was nice to see these posts recently assist two of my favorite writers and tweeters, Zachary Bennett and Matt D’Anna, in looking at how to retool divisions and conferences, or even get rid of them. That probably did more for me than it did for them since it looks like this blog has a few extra readers daily, and it was nice to know there was at least some usefulness in these posts. Good stuff. I definitely celebrated with a ham sandwich. It was fantastic. But that’s it for this series, at least until next season when I could see the West pulling off a top-5 point differential. There are some likely rising teams out East like Washington, Toronto, and Chicago in a way, among others, but the West has as many if not more teams that should improve like Phoenix, New Orleans, and possibly the Lakers and ones that should stay legitimate in Oklahoma City, Houston, and the Clippers. Of course, there’s a whole off-season to play out and the East could balance itself somewhat with teams rising from the lottery to 40-win territory, but for now I’m siding with yet another loaded Western Conference.